It’s time to look at the Isle of Dogs. This film looked worrisome from the get go for a plethora of reasons, but the main 2 were the stop motion animation (The worst form of animation) and the fact that it revolves around dogs. Unfortunately the film goes above and beyond what I had thought it would do and turns out to be one of the worst films out there. Brace yourself because this film is brutal! So, the film takes place in the future and dogs have all been found to be dangerous since they are contaminated with a disease. The government banishes the dogs to a lonely island where they will all end up dying. One kid heads there to find his lost dog, but this will be a difficult quest. There are robot dogs after him to ensure there are no survivors and we also have an election going on in the background. Can the kid find his dog? The film was doomed early on as there is a ton of animal violence. I can’t think of the last time I saw this amount of dog violence in one film. It’s almost constant as they get bit, die, and undergo a lot of injuries. While the bulk of them are on screen the film also makes sure to remind you on many occasions that they’ve also already had many more injuries. The film tries to be very dark and gritty throughout its run. The movie succeeds on this, but of course that isn’t a good thing. Not only do we get all of this happening, but the stop motion intentionally makes all of the characters look disfigured and bruised as much as possible. It’s to the point where it’ll be hard to look at the screen for most of the characters since they just look so messed up. This is the case for about 90% of the film so it’s not like it was just a quick scene or two. The injuries stay on the characters continuously in part thanks to the fact that the stop motion is keeping the same character models for so long. You’ll be cringing for the entire movie, just not in the usual cringe like when a character says something painful. It’s just because you can’t bear to see what’s happening. Usually stop motion films can be fun for the very rapid fire styled dialogue where the characters go on and on with burns and comebacks. There is less of a chance for that here because of how seriously the film tries to present itself. There is never a chance for happy conversations like that. The cast of characters is also pretty bad. The main kid is just a nuisance the whole time as he tries to assume command of Duke when he should be worrying about getting off the island alive. He wastes time going on rides and playing fetch and generally acting like he doesn’t have a clue. The kid’s a terrible character and just not very smart to the extreme. I don’t need to go into much detail on the animation since I already expressed that it wasn’t very good, but the main reason behind that is that it’s always very choppy. The scenes quickly jump around and there’s no time for any real detail. The film just makes everything look grotesque, but as a result there naturally aren’t any good visuals to be enjoyed. The soundtrack was all right I suppose. I can’t really fault the film in this area since it wasn’t bad. The music would work well in a better film since some of the tunes had potential. It’s nothing to write home about, but it worked well enough. Aside from all of the dogs running around we had the political subplot as I mentioned. That plot is dreadfully slow and most of the scenes are just about the American transfer student trying to show everyone that the mayor is corrupt. The problem is that nobody really seems to care and her plans don’t go anywhere until the kid and the dogs actually appear. Otherwise all of her efforts would have been futile so her plot really didn’t end up amounting to anything. I also have to say that keeping the languages untranslated was a terrible decision as well. You could have characters talking for whole minutes and you can’t understand any of it. It’s pretty obvious what they’re saying but it ends up being a waste of run time if you ask me. The film could have used that extra time to do anything else. It’s just a design choice that I think really didn’t work and just added to the list of woes for the film. If I had to choose a best character it would be the Chief since he was pretty tough. It’s a shame that by the end he was forced to be more tame though and ends up going through a rather predictable character arc. The other dogs were good enough even if their resolve wasn’t quite as good. The villains are fairly generic and just evil for kicks. The last minute change of heart wasn’t all that believable so you were still ready for them to go to prison. Finally, the film is also too long. It’s a little over an hour and a half with very slow pacing. It feels like nothing much really happens in this film. Most of it is the kid traveling with the dogs until they ultimately arrive at their destination. Any time you may try to get invested in the film you will be knocked back out by a dog scene. It’s impressive that the film got so many big names into it, but that’s not enough to actually earn the movie any consolation points. I’m afraid that it’s all over for this film. 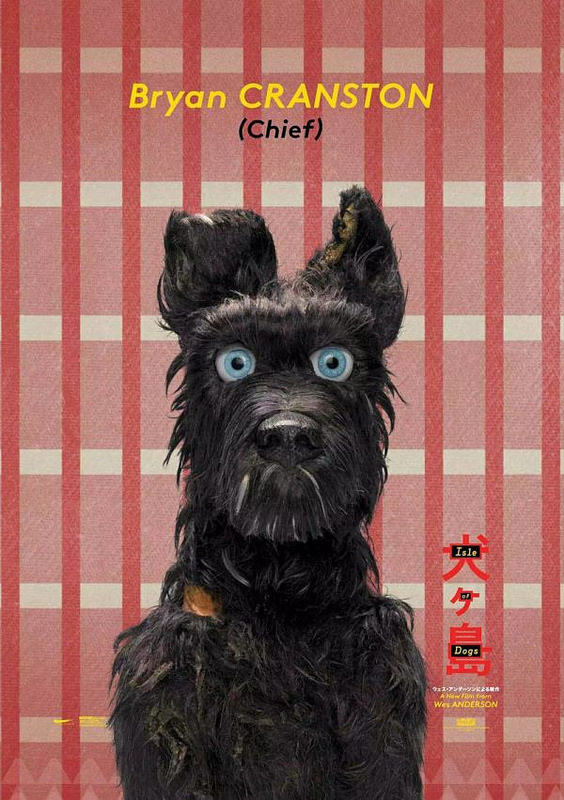 Overall, Isle of Dogs is definitely a film that you will want to give a hard pass. Whatever message is was going for ends up getting completely lost among all of the senseless violence and cringe character injuries. I don’t think the film ever had much potential with its general plot though and if it wanted to be good it would have needed an entirely different story. I can say with confidence that this is always a really bad sign. Perhaps better animation could have helped as well, but not enough to really matter. I’d highly recommend watching a film like Air Bud instead. This entry was posted in Live Action Movie Reviews, Live Action Movies, Reviews and tagged Animal Violence, Bill Murray, Bryan Cranston, Dogs, Edward Norton, Film Review, Isle of Dogs, Jeff Goldblum, Movie Review, Review, Scarlett Johansson, Stop Motion, Wes Anderson by dreager1. Bookmark the permalink. … I thought this was going to be a somewhat fun film about an island full of dogs. No one told me they’ve been banished and killed in this movie!! I’d rather go watch that upcoming dog movie about dogs in people’s lives. It doesn’t look that interesting, but at least there are happy dogs in that one! It’s a really dark film throughout which definitely doesn’t work for me. When it comes to dogs I certainly want to see them be happy as well so this one got a thumbs down from me almost instantly. It really checked off all of the wrong boxes.